Join us on Saturday, April 27th from 10 a.m. to 3 p.m. for the highly-anticipated Model Grand Opening of Emerald Park at New Haven in Ontario Ranch. Be among the first to tour our beautifully decorated model homes at Solstice and Holiday! Get there early to enjoy delicious doughnuts and coffee, and stay for tasty treats provided by Pio Pico’s Tacos, a Vintage Photo Booth Bus and a live DJ. See you there! First-time homebuyers, Katie and Zack found the home of their dreams in New Haven in Ontario Ranch. Life in their new home is everything and more. They had a wish list: an open-concept living area, four bedrooms, three bathrooms and a modern farmhouse style. They were also thrilled to work with the Brookfield Residential Design Studio to be involved in the customization to ensure that their new house felt like a home. Her advice for designing a new home: “take time to make it yours and try not to bring anything into your home that you don’t truly love”. Newlyweds Lauren and Jordan dreamed about one day owning a home that they can grow their family in, a place to call home. They came across New Haven in Ontario and fell in love with the Residence 3 at Solstice and their fate was sealed. They loved all the amenities, including the pool with beach entry and the location was ideal for work and family. With their little bundle of joy on the way, they felt comfortable building their life and family in their dream home at Solstice. Congratulations to this beautiful family, the new baby and your beautiful new home! Former high school sweethearts, Tony and Sara searched for a home in the Inland Empire and surrounding areas and could not find anything they loved, until they visited New Haven in Ontario Ranch. They fell in love with the idea of having more space to entertain guests, the amenity-filled parks for their son and resort-style pools to relax as a family. 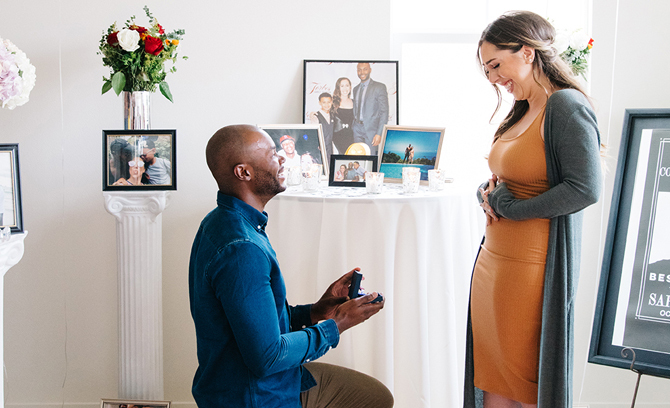 Little did she know that there was more in store for her than a new beautiful home, an Engagement! Congratulations to this beautiful family and welcome home! The De Anza Community and Teen Center in Ontario is hosting a free Valentine’s Day Party on Friday, February 15th from 6 p.m. to 8 p.m. Kids from 12-18 are invited to this special event, when they can compete with other teens in a life-size game of Clue and enjoy a delicious, mysterious snack. The winning team will also receive a prize! For more information, call 909.395.2030. If you’re a serious runner or casual walker, don’t miss the Ontario 5K and 10k Run/Walk on Saturday, January 19th. This family-friendly event kicks off at 7 a.m. at Ontario Mills Mall. Fast track is accessible for wheelchair athletes as well as parents with strollers. Get your fitness on for this community run, which also benefits athletic programs and children’s sports activities in the Inland Empire area. Have fun and see you at the finish line! Two brand new neighborhoods priced from the low $300,000’s are coming to New Haven at Ontario Ranch, and that’s great for first-time homebuyers! Get ready for the 2019 debut of Holiday and Solstice at Emerald Park. Modern townhome designs will have up to three bedrooms, plus innovative amenities and smart technology. Outdoor recreation at Emerald Park will be perfect for swimming, picnicking, or watching the kids have tons of fun at the super playground. Stay tuned! Christmas on Euclid Event brings Cheer to the Season! Celebrate the joy of the season on December 5th at the Christmas on Euclid Annual Holiday Event. Don’t miss this fun-filled day from 10 a.m. to 5 p.m. with enjoy reindeer games, snow play, carnival rides, live entertainment, and so much more! This special family event will also have live music, dancers, Santa Claus, craft vendors and an array of fabulous food. See you at Ontario Town Square! Don’t Miss the First-Ever Ontario Reign Hockey Fights Cancer Event! Hockey lovers, enjoy a great night at the rink and support the Childhood Cancer Foundation of Southern California! The Ontario Reign is hosting the first-ever “Hockey Fights Cancer” Night on November 3rd at 6 p.m. at the Citizens Business Bank Arena. The American Cancer Society is presenting this special event, and proceeds from ticket sales help fund programs for families in our community who have a child battling cancer. It’s also a giveaway night, and the first 5,000 fans will receive Active Socks. Be there, have fun and make a difference! The New Haven Marketplace has broken ground, and that’s very exciting news for Ontario Ranch residents! Shops, dining and services will be just a short walk from home, and will include Stater Bros., Chase Bank, Carl’s Jr., Dunkin’ Donuts, Kona Cleaners, and more. Farmhouse-inspired architecture will complement the community’s ambiance, and there will be spaces and places to socialize, relax and play. Public art will also be on display to inspire conversation and Instagram pics! The highly anticipated New Haven Marketplace will span approximately 95,000 square feet, and is scheduled to open fall 2019. Stay tuned, great stuff is always happening! Save the Date for the Route 66 Cruisin’ Reunion! Thousands of classic car lovers from across the country and around the world are gearing up for the annual Route 66 Cruisin’ Reunion! On September 21st and 22nd, downtown Ontario’s historic block of Euclid Avenue will be the center of vintage automobiles and motorcycles, plus live entertainment, kids activities, and tons of food vendors. New events for 2018 include the West End Animal Shelter, which will be onsite, amazing tribute bands, extended hours and much more! This family-friendly event is free and open to the public, see you there!